In June, the boundaries for the electoral areas for the 2019 local elections were announced. You can read the full report at this link, but here is a summary for our voters and members in Dublin South Central. 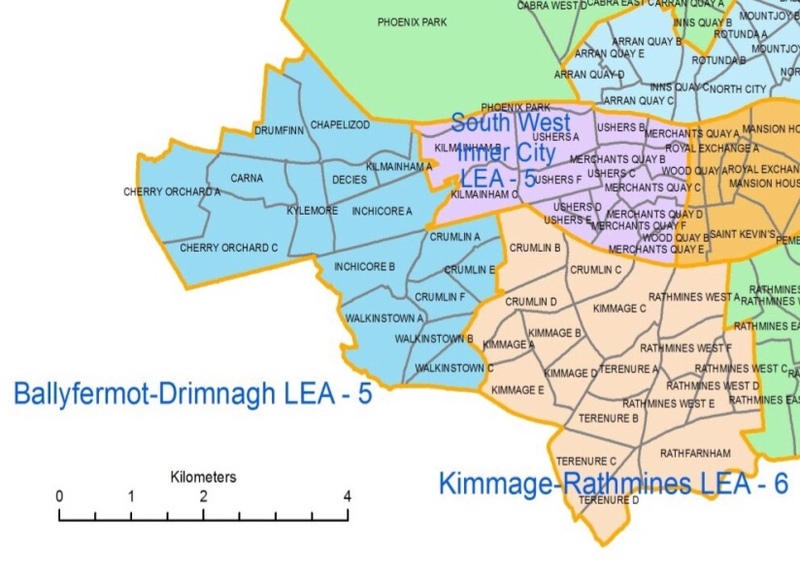 Most of Inchicore and Islandbridge have been removed from Ballyfermot-Drimnagh, with only the “Inchicore A” district, which is an area centred around the Oblates on Tyrconnell road remaining. There will be 5 councilors elected, a reduction from 5 from 2014, when Oisín Ó hAlmhain got 550 votes, which was well short of a seat. This area also includes those parts of Walkinstown that are in the city council area. The area of South West of Inner City, which is the same as it was before the 2014 election spans from the Liffey to the Canal, between Inchicore and Patrick Street. This includes some communities who have voted green in great numbers in the past, and as part of a wider South Inner City elected Ciaran Cuffe to the council in 1999! The remainder of Crumlin and Kimmage now joins Terenure and Rathmimes in a 6 seater Kimmage-Rathmines area. In 2014 Councillor Patrick Costello topped the poll in the part of this area which was in Dublin Bay South, and we have a number of hard working local members in this area. This also includes the lower end of Drimnagh from Benbulbin Road down to Dolphin Road. Finally, Perrystown, Greenhills, Whitehall Road and Fortfield are part of a 7 seater Rathfarnham-Templeogue. This area had a green Councillor in the past in Tony McDermott from 2004-2009. It also stretches to the few houses around Ballymount & Fox & Geese off the Naas Road. There will be selection conventions in the near future to choose Green Party candidates to run in each of these wards. In the meantime we hope you are getting ready to get our there and help canvass for your local representative. While the number of seats in each area have been reduced, which makes it harder for candidates from smaller parties to get elected, we relish the challenge, and look forward to having great candidates in each of the areas with a good chance of having at least 3 councilors in 2019!